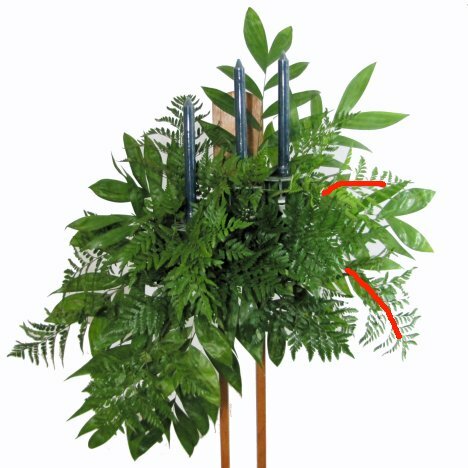 This church decoration really begins to take shape with the addition of leather leaf fern This versatile greenery is used by flower shops everywhere. I always buy a few bunches more to make sure I have enough greenery. I continued to fill out this flower design by inserting leather into the center of the Oasis Jumbo cage. See the angles below. Leather is very easy to cut into smaller pieces, as they have miniature laterals up a very slender main stem. 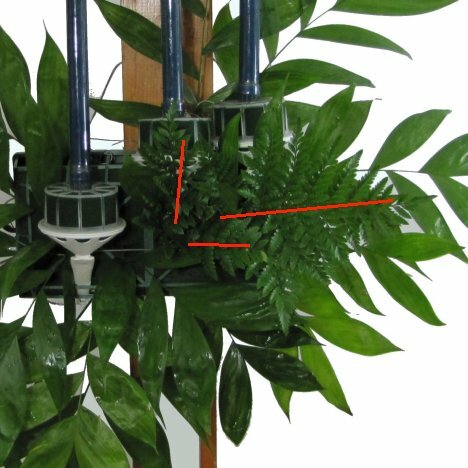 Insert more stems, following the directions of each stem as shown in the photo below. 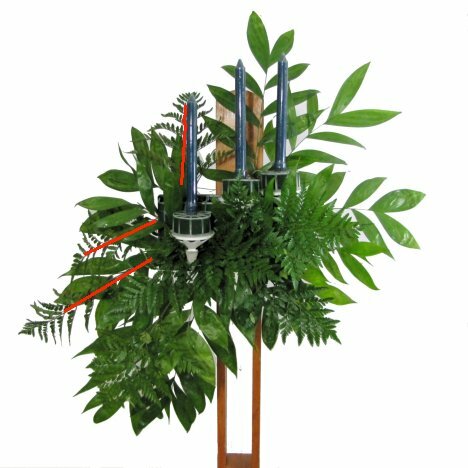 You can see how the greenery is doing a great job of concealing not only the Jumbo cage, but also the white plastic handles of the bouquet holders inserted to hold tall candles for the ceremony. Now I start using a whole stem, inserting three more pieces on the left and upper portion of the design. Your designs don't have to perfectly match mine - just follow loosely the framework as shown. If desired, you can easily adapt this to be a lateral piece, with greens at the same angle on the right and left. Step back occasionally to view your design from a distance. Remember that most guests at a wedding are seated at least 15 feet (or farther) from the wedding party. You want to emphasize a large size so that the flowers don't get overwhelmed by the open space of the ceremony space. 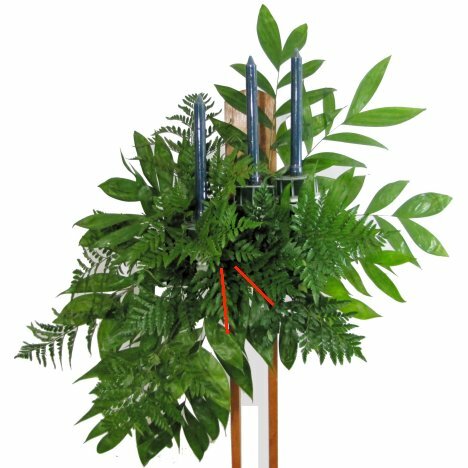 I've inserted blue candles just to give you a feeling of their placement. 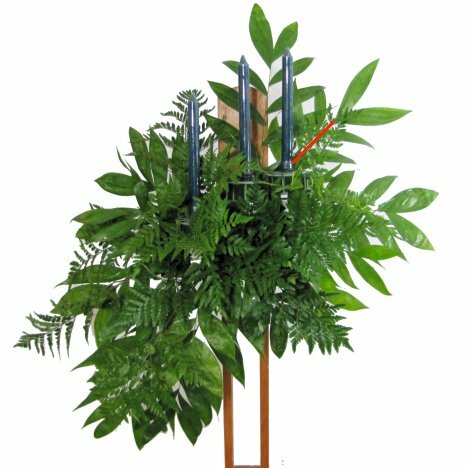 I plan on using much longer candles that rise above the greens, giving a more impressive look and keeping the flame away from the greens. 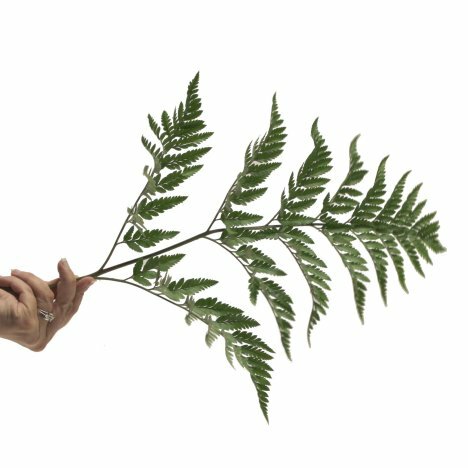 You can see another leather leaf inserted so it is sweeping downwards on the left side. I give this balance by inserting two more leather stems on the other side. 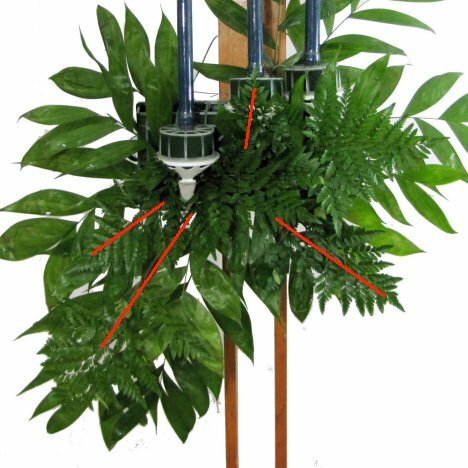 Now the main form of the candelabra flowers has been defined. I'm going to emphasize the outer length of this design by adding in another greenery called myrtle.